The final stage of the East London Overground Line northern extension, from Dalston Junction to Highbury & Islington, is to open on Monday. We now have two Dalston stations with lines going to Highbury - the North London (Orbital) Line from Dalston Kingsland station and the East London Line overground extension from Dalston Junction station. So why the luxury of two? Readers will recall the Secretary of State saying that the new Dalston Transport Interchange (the rail/bus interchange built over Dalston Junction railway cutting) "will be a major transport interchange between the East London Line northern extension, the North London line and London buses, as essential part of transport improvements required for the London Olympics 2012". But the East London line at Dalston Junction doesn't go to the 2012 Olympic site at Stratford. Nor does it interchange with the North London line, at Dalston Kingsland station, which does. And the one bus which will use The Slab above the Dalston Junction station doesn't go to the Olympic site either - despite the £63million spent on it. The bus stop on The Slab at Dalston Square which is to be used by just one bus - not the 60 per hour which we were told it was built for. When we met the London Development Agency (LDA), with OPEN's patron Lord Low, we pointed all this out. 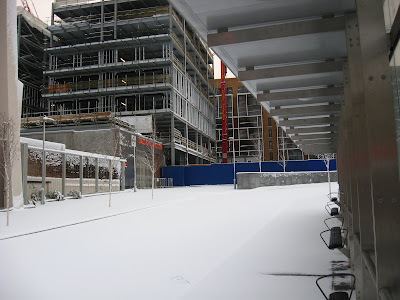 We were told by the LDA that it would not be the first Transport Interchange to have been built in the wrong place... but the problem was not insurmountable. Now those clever people at TfL have solved the problem. People using the East London line can now get the train from Dalston Junction to Highbury, change onto the North London line, and travel back via Dalston Kingsland to get to the 2012 Olympic site at Stratford. Hurrah! Still, mustn't grumble - the £63million spent on The Slab is only TfL's money wasted, not ours. Isn't it? Yes - if you believed TfL's Head of Communications. He wrote a letter to the Hackney Gazette, when TfL was promoting the Transport Interchange back in 2006 -"It is currently proposed that TfL will meet the cost of the rail station and the potential bus station". But sadly it didn't turn out like that. Hackney paid millions by selling their site to Barratt for a peppercorn to cross-subsidise TfL's Slab, our historic buildings were demolished, and Dalston's environment has been blighted by overbearing towers blocking out the light. 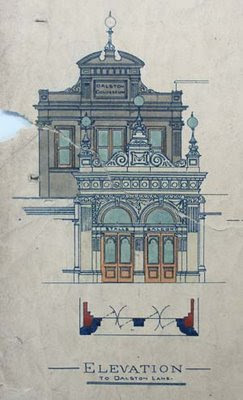 The old 1886 Dalston Circus and 1898 Variety Theatre were demolished to create the development site for Barratt's blocks of private flats. 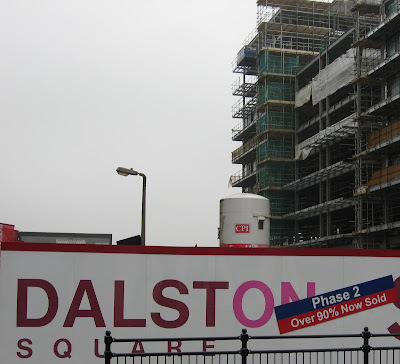 The demolitions have left Dalston, as someone said, looking like an old friend who has had her teeth knocked out. Hit by a runaway train more like. This is the view north from Dalston Lane showing the demolition sites on Kingsland Road above the renewed tunnel to Highbury. (PS - When will Tfl announce that 60 hopper buses an hour will be ferrying people from The Slab to Stratford for the three week 2012 Olympic event? And that's why the £63millon Slab was built. And why old Dalston was demolished and replaced with tower blocks to help pay for it. Ed.). 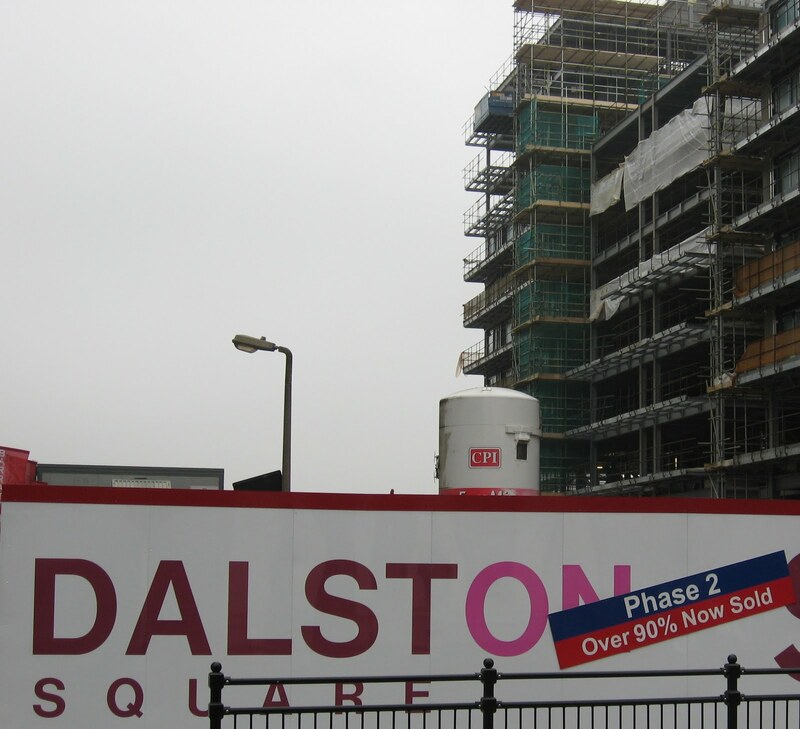 Barratt's Dalston Square Phase 2 is cracking on at a time when there remains uncertainty in the housing market and bank mortgages are hard to come by ( unless you are a buy-to let investor) . 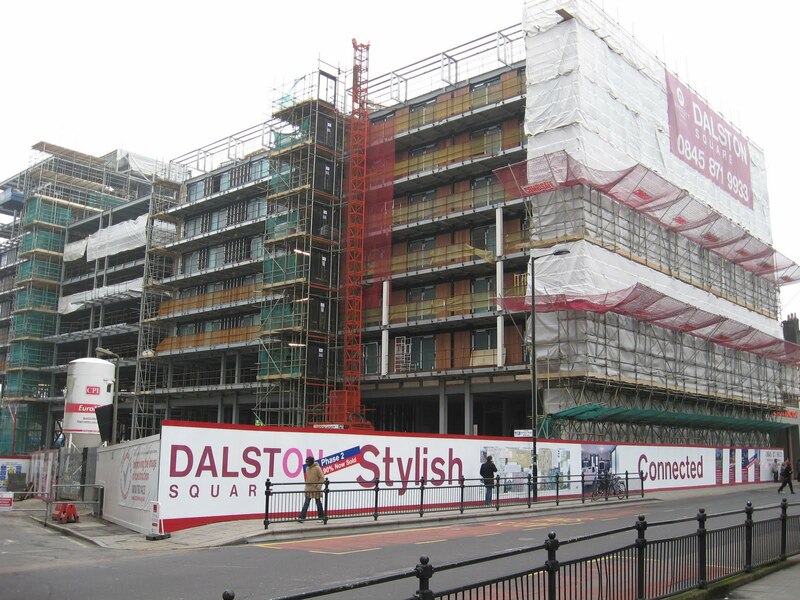 Now Barratt claims that 90% of the private flats being built in Dalston Square Phase 2 have been sold off-plan. Have they been sold to owner-occupiers - or are overseas buy-to-let investors moving in? This recent promotional piece about Dalston Square in the Hong Kong Standard below gives us a clue - there was similar overseas promotion for Phase 1 as well. Buy-to-let investment by cash rich overseas buyers keeps prices artificially high, squeezes out first time buyers and creates transient communities on short term tenancies with no long term commitment to the area. Is it not depressing that the £millions of public money which has subsidised this scheme, which has no affordable housing, is not benefitting local people or even Londoners.